Chitina is located on the west bank of the Copper River at it confluence with the Chitina River, 66 miles southeast of Glennallen. It lies outside the western boundary of the Wrangell-St. Elias National Park and Preserve. Chitina is nestled between two of the largest mountain ranges in North America; the Chugach Range, which stretches along the South Central Coast of Alaska and the Wrangell Mountains which are home to some of the tallest peaks and largest glaciers in the world. The community is located in the Chitina Recording District. The area encompasses 29 sq. miles of land and 1 sq. miles of water. Athabascan Indians have reportedly occupied this region for the last 5,000 to 7,000 years. Archaeological sites are located to the south and east of Chitina, and for centuries the Ahtna people had summer fish camps along the river and winter villages throughout the area. The surrounding lands were originally home to the Native Athabascan people of the Copper River. The area of "Tsedi Na" was originally home to several summer fish camps and a winter gathering area for the first people of Alaska. The town's name is a mistranslated version of the Athabascan word "Tsedi Na" which means the river (Na) that flows like copper (Tsedi'). Before 1900, Chitina was the site of large Native village whose population was slowly decimated by the influx of people, disease and conflicts. Rich copper deposits were discovered at the turn of the century along the northern flanks of the Chitina River valley, bringing a rush of prospectors and homesteaders to the area. 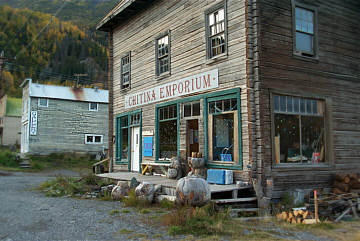 Chitina was established as a stop on the Copper River & Northwestern Railway in 1908. The town became a booming supply center receiving goods via the railway from the sea port community of Cordova. Supplies were shipped via the railway on to McCarthy/Kennecott, as well as onto the interior city of Fairbanks via the overland haul road. Predictions swirled stating Chitina would be the new capitol of Alaska circulated in that first part of the 20th century. The town had develop into a thriving community by 1914 with a general store, an art gallery, clothing store, meat market, stables, a tinsmith, five hotels, several rooming houses, a pool hall, bars, restaurants, dance halls and a movie theater. Almost all of Chitina was owned by Otto Adrian Nelson, a surveying engineer for the Kennecott Copper Mines. He built a unique hydroelectric system that supplied electric power to all his buildings. Then ore prices sharply declined and with that drop the mine closed. The last train departed Chitina in 1938. Support activities moved to the Glennallen area, and the once booming community became a virtual ghost town with only the Natives and a few non-Natives staying on. In 1963, the Nelson estate was purchased by "Mudhole" Smith, a pioneer bush pilot, who sold off the townsite and buildings. Much of the land in the area is now owned by the Chitina Native Corporation. Chitina lives on with 123 residents (as of the 2000 census) residing in the town and supporting themselves largely with salmon from the river, produce from their gardens, berries from the forests, and the few tourists who stop. At present the community consists of a general store, two small convenience store/gas stations, three gift shops, three lodging establishments, a post office, a seasonal National Park visitors cabin, a coffee shop & deli, saloon, liquor store, fire hall, laundromat with showers, a seasonal burger stand, local state Fish & Game offices and highway maintenance offices. The town is known for its seasonal salmon runs of reds, kings and silvers. A summer influx of fishermen, tourists and campers provides some revenues for fish guiding and other local services. A federally recognized tribe is located in the community -- the Chitina Traditional Indian Village. 48.8% of the population are Alaska Native or part Native. Most residents are involved in subsistence activities year-round. During the summer, subsistence dipnetting for salmon on the Copper River brings a large number of Alaskans from Anchorage and other areas of the state. Gardening, berry picking, herb gathering and other "wild crafting" are popular pursuits, as are various arts and crafts. Winter activities include trapping, snow machining, dog mushing, skiing and skijoring, ice fishing. The climate in Chitina is continental, characterized by long, cold winters and relatively warm summers with temperature extremes from -58 degrees F. to +91 degrees F. along the year. Snowfall averages 52 inches, with a total annual precipitation of 12 inches.